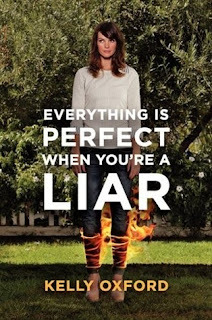 The funniest—and hottest—mom on Twitter plunges you headlong into her life in her hilarious memoir, Everything Is Perfect When You’re a Liar. With her trademark blend of biting wit and self-deprecation, this side-splitting book of essays will make you laugh, cry, and then laugh some more. Sharing her life story in Everything Is Perfect When You’re A Liar, the straight-talking and riotously funny blogger Oxford opens up about her childhood, motherhood, and life with that zany, skewed perspective that make her the toast of the social media world. Not so long ago, I posted this discussionary post about success prompted by an article about renown comedy writer, Kelly Oxford. I'm a big fan of hers so when I found out she wrote a book, I knew I had to get my hands on a copy. Oxford has gained legions of fans due to her incredible wit and irreverent observations as showcased on both her blog and Twitter. Personally, I think she's hilarious so I figured her book would reflect that humour quite succinctly. Unfortunately, some of that humour doesn't translate to the page as well as I hoped it would. That's not to say this book isn't funny, because it is, but I found some of the stories to be totally unrelatable, hence---not very funny. The book is broken into individual essays, each one recounting an important moment/event in Oxford's life. Where these little vignettes are exaggerated, they are also disjointed so it makes it a bit hard to follow. You're better off looking at them as separate entities rather than a book. Now some criticize this book for being too crass and narcissistic, but if you follow her on Twitter, you ought to know better! Humble, she is not. Look, it's not easy writing about yourself so I do have to give her credit for being so bold. I will, however, admit that she's made some poor life choices (as chronicled here), ones that I cannot abide. And there were definitely moments where she comes off as an overly privileged, pretty girl. And these are the parts I didn't like. It isn't until she has a serious brush with reality that her tone changes and the book finally becomes endearing. There's depth and humour in it, the kind of humour that I was waiting to see. Everything Is Perfect When You're A Liar isn't the funniest book I've ever read, but there is a note of sincerity towards the end that makes it a decent read. I was hoping for more here but this isn't the first time a funny person wrote a book that left me feeling a little disappointed. Perhaps these types of books aren't for me? Or maybe, just maybe, these funny people should stick to their usual mediums of comedy. Everything Is Perfect When You're A Liar is one of those not-so-funny-books written by a very funny person. While I did find some of the essays to be entertaining, overall, the book was a bit of a letdown for me. I think only a specific demographic (i.e. - her fans) would really appreciate Oxford's style of comedy here. I've seen a lot of buzz around this one. I must be living under a rock, because until I heard about the book, I had no idea who she was. I know what you mean, sometimes funny people should stay in their mediums. I read a Chelsea Handler memoir a few years back that I enjoyed, but felt wasn't as funny as she is on TV. Thanks, Naida! I'm just wondering if maybe these types of books aren't for me. I read Mindy Kaling's book about a year ago and wasn't too impressed with that one either. Oh well. At least I know better now. I really didn't know who she was either. This sounds interesting though and I may look more into this. I'm sad the book isn't as funny as you had hoped it would be. Great review! I have found that sometimes comedians books aren't as funny as they are. Don't get me wrong, there are certainly funny parts to the book but, overall, I prefer her online humour much more. I just think these types of books aren't really for me.